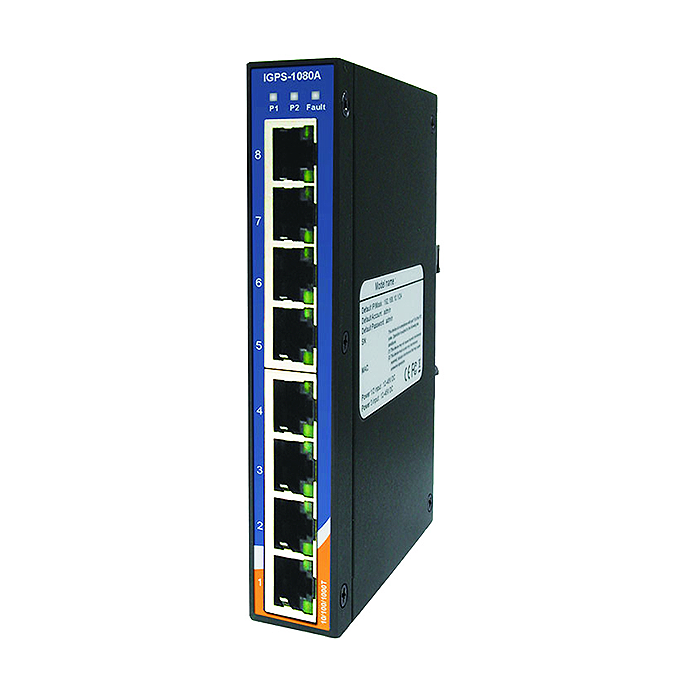 The IGPS-1080A Ethernet switch features Power over Ethernet, a system made to transmit electrical power, along with data, to remote devices over a standard twisted-pair cable in an Ethernet network. This switch has eight 10/100/1000Base-T(X) P.S.E. (Power Sourcing Equipment) ports. P.S.E. is a device (typically a switch or hub) that provides power in a PoE setup. It includes wide operating temperatures ranging from -40ºC to 70°C that allow the switch to handle the harshest operating environments. Clearly, this switch is one of the most reliable choices for PoE Ethernet applications. The IGPS-1080A can also be used in connecting several PoE P.D. Ethernet devices like IP-Cameras or other Ethernet devices. In addition to its key features, there are two different power inputs at its terminal block to avoid interruption caused by power down. When the primary DC power input fails, the backup power input will take over immediately to guarantee non-stop operation.